that is what this app is about when I had a firsthand experience on it. where this song fits so well for this app it still evokes me to tell you that SharePoint app doesn’t take you away but wherever secret place you are it will connect you to your world. Let’s start exploring this wonderful app which will keep you up to date of your work moving forward proving you access to your office’s intranet in your hand. As a first user, I would like to give you a tip if you are thinking to download this app. I would suggest you let the IT person in your company know that you are downloading this app so he can walk you through the authentication process and will let you know if some other app is also to be downloaded as the security policy of the company if your mobile get lost or stolen. Then these security app can erase confidential data from your lost or stolen device. The other app you should download along SharePoint is the One Drive mobile app so that you can open your documents easily. 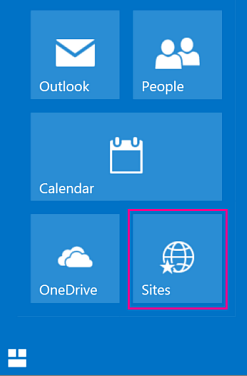 The SharePoint mobile app and the OneDrive mobile app can be synced. When both are installed. It shows all the news post from the sites and group you follow or frequently visit. It keeps you updated about all the activities happening in your work world. I find this option as a very smart feature as you are accessing the intranet from a remote area and still is up to date about the latest news of your work environment. This links to your organization and resources portals that were created for your organization by your SharePoint Administrator. The links screen provides you with easy access to both internal and external resources. if your company has a Quick link section on their intranet, then those links should be displayed in this area. It shows all the sites you have frequently visited and the sites you are following (You can follow the site by clicking the star option provided on each site’s right-hand corner). As you click on the name of the site it will take you to the site and will show you all the latest activities that have taken place. click on the three lines on the left side on the site will take you to the navigation to the site menu. It shows the Contact picture, Name and the designation of all the people you work with. Which further leads you to each’s introduction page, where you can see the details about the people and the documents each is working with and working on forming a breadcrumb menu for each. The search is located on the top right corner of your mobile screen, this SharePoint search option obviously lets you do the content discovery and can do so while filtering by sites, file and people. In my opinion, this is another a very smart feature in the new SharePoint App. using this feature in the app is the effortless way to find the information you are looking for. Here you can find the links to your profile and add or switch the profile. it gives you option shake to send a feedback. which send a message where you can report a problem or suggest an idea. This was a one of the cool function provided in this. Use this feature to constantly improve this mobile application. Talking of new Microsoft iOS apps, Microsoft also launched a version of its Flow event-automation app for iOS platforms. 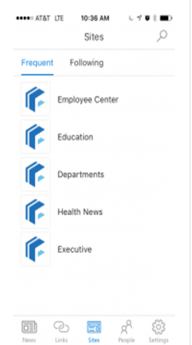 The SharePoint Mobile app is aimed to provide help people get very easy access to four types of information from SharePoint few of them are news from across the company, the sites that people use the most, quick links to most frequently pages and a list of their work buddies. It will work with both SharePoint Online and some versions of SharePoint Server. Utilizing information from the Microsoft Graph, the app will be able to make out which people use the which sites most frequently and with whom work with the most and make those more easily available. That same prospects are also seen in power functionality inside the app that shows users files which are closely connected to them. 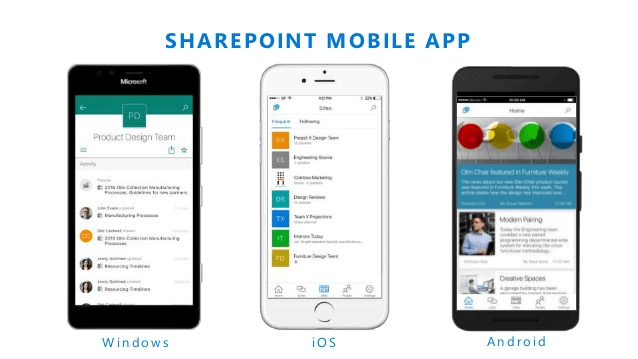 The SharePoint mobile app is available on both iOS, windows and android platforms Since the iOS version has been out several months longer, it has more functionality and features than window or Android version. We can bet that Microsoft will be adding that functionality in the future, though maybe on one operating system at a time. For example, Team News is one of many features many are excited about in Version 2.0 of the iOS SharePoint app. 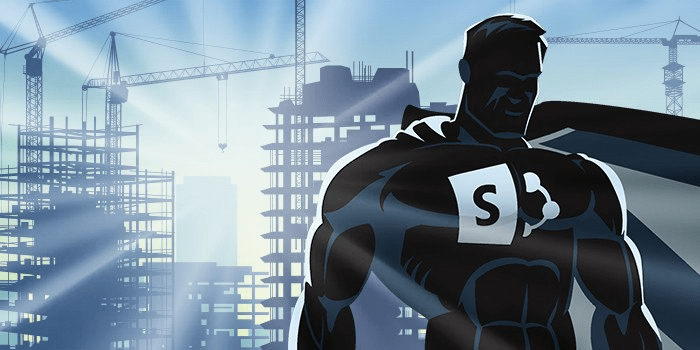 And many Android and Windows users are eagerly waiting for the day Microsoft adds support for on-premises deployments to their SharePoint apps. Even In the case of 3rd party apps The SharePoint app is well developed for iOS at this point. So, it’s very safe to tell that you’ll get this functionality from Microsoft as you do from your 3rd-party app or your mobile’s browser. While in Windows and Android user The SharePoint app is still working through because they’re in first-release. So, you’re absolutely be waiting for version 2.0 before you leave behind that 3rd-party app you always have been using. The overall rating of this app is 3.5 which is not bad for a modern technology. Microsoft is constantly working on the improving the app. with all the feedback of the users. Don’t forget to use that shake to feedback feature in the settings and help to upscale the app according to your needs People who are always on go and those who require working in remote areas like civil and mining industry benefit from the mobile app of SharePoint. While visiting the sites they are still connected to their work place. It will not be wrong to say this app is a hero which is still in making.